On December 27th the world was shocked by the news of the assassination of Pakistan’s Benazir Bhutto. A powerful woman leader, controversial in that she had been deposed twice for corruption, but still a great hope for the future of Pakistan. On Sunday January 6th many of us woke to another shock: an interview with Ms. Bhutto in the Parade supplement to many of our Sunday morning newspapers. A cover story no less. My first reaction was that the article was a tribute, but then the quotes made it clear that the author was unaware of her assassination when the interview was written. As Benazir Bhutto seeks a return to power, Tuesday’s election in Pakistan could profoundly affect the fight against terrorism. 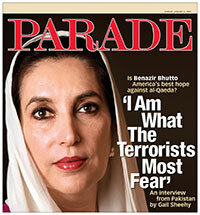 Editor’s note: The assassination of Pakistan’s Benazir Bhutto on Dec. 27 occurred after PARADE’s Jan. 6 issue went to press. Bhutto’s murder adds more danger and confusion to the already chaotic situation in this region. PARADE’s Jan. 6 interview with Bhutto is one of the last interviews of her complex life. After her assassination, PARADE immediately posted the entire interview online, and Sheehy appeared on network and cable TV news shows to discuss her face-to-face conversations with Bhutto. So the fact that there was no explanation in the print version indicates one thing: Parade was already in an unchangeable printing process on or before December 27th. Ten days. Reason magazine said it best with a brief online article: The Perils of Long Lead Times. Perils indeed. I do not know very much about the Parade publishing process, whether it is printed centrally or locally, and how it is distributed. Most articles are about the latest exploits of Britney Spears and Lindsay Lohan, repeated insight on how to lose weight, and of course the Ask Marilyn brainteaser column. Not exactly time sensitive. Perhaps time has never been an issue. Just like toy companies sourcing product from China probably didn’t understand the true impact… and cost… of time until they awoke one morning to learn about lead-tainted toys on the shelves… and millions more slowly making their way across the ocean. Long lead times create the measurable cost of higher in-process inventory. But they also create a potential less tangible cost in risk. A lesson Parade just learned. UPDATE: I received an email from a reader that provided some detail on Parade’s publication process. The files are created digitally (in India) and can be sent to any one of a dozen print plants across the country who do this type of work. If it were any other month, or weekend, Parade might have had a shot at a reprint. But, since it was year end, every plant manager was pushing every last inch of product out the door, or else they’re out the door, and there’s only so many hours in a day. Then there are the contractual issues with the USPS, with the publishers of time sensitive periodicals, with the credit card companies, banks, and other lending agencies who want their customer bills sent out on the day they want them out, else they lose one day’s worth of interest charges (which add up to Trump like numbers), and the financial institutions who have SEC rules to deal with when it comes to disclosure requirements and year end reporting. The penalties for missing these dates are hefty. If a press didn’t have work – run more inventory! Worry about inventory variances next year – get the credit this year! Parade never had a chance, if they even bothered to ask for a break in. My guess is that they didn’t want to toss the inventory and pay what would have been an outrageous break-in charge. Sounds like they could really use some help! I, too, was shocked to see this article in Parade. I suspected that it was printed earlier, so I looked at the front page the Sunday paper. At the bottom of the front page was a footnote there explaining that the Parade article was indeed printed before the assassination. Just wondering: Did you confirm whether the information in that reader note was correct, or that at least the author of that note is in a position to have first-hand knowledge of Parade’s production, distribution, and contract issues? There were a lot of facts asserted in that message, and I’d like to know if you’ve ascertained how reliable they may be. It’d be helpful if you could be transparent about that. I’ve known the person that provided those comments for quite a while, and he is in a position to know. Other than that I can’t assert how accurate it is.